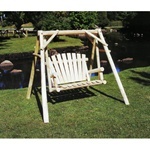 Wooden garden benches can provide a great place for you to sit and take in the beauty of your garden or patio. 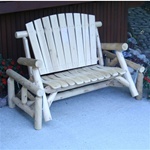 Wooden garden benches also give your garden an architectural quality to your garden that can provide a unique counterpoint to the natural beauty of your flowers & foliage. 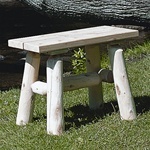 Many of these are cedar wooden benches made from 100% cedar. 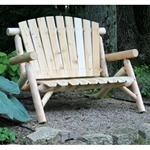 This cedar is a renewable and environmentally safe resource since it is a by product of the log home industry. 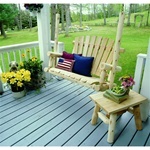 In addition to wooden garden benches, we also offer vinyl benches. 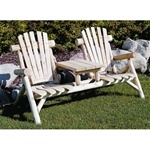 Home Products 'N' More only offers the high quality UV resistant vinyl outdoor benches. Some of the vinyl benches are made from high grade PVC vinyl, while others are made from high density polyethylene or virgin polypropylene. Because we only select manufacturers that produce the highest quality products, you can be sure that your new vinyl bench will last a very long time! 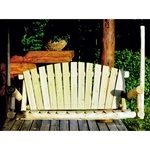 Some of our vinyl bench ends will require that you purchase wood to complete the bench. 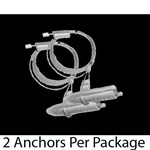 This gives you the ability to choose a custom length for your bench as well as what type of material to use. 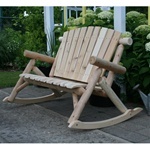 And if you don't feel like buying wood for your vinyl bench, we offer a vinyl seat & seat back kit which will fit our Rocker Garden Bench Ends and our Wooden Garden Bench Ends models. 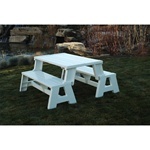 Two of our vinyl products can turn from park benches into picnic tables. Simply move the seat backs into the horizontal positions and you are ready to eat! One of our benches is set in a lovely vinyl arbor which will never need painting and can give your climbing vines a place to flourish!